The Caring Center has served Verona-area families for more than 40 years. We take our commitment to providing quality programs for children very seriously. It is our objective to care for and about each child who is a part of our child care center. Your trust is our privilege. We want to make positive contribution to your children’s lives during this important, formative time. Our fall program follows the Verona School District school year, from September through mid-June. With the exception of major holidays, we remain open for non-school days. Details about the holidays that we do close for can be found in our Parent Handbook. Summer camp sessions typically begin the week after the Verona School District school year ends and continue to the last weekday before Verona schools are back in session. When does registration begin for Summer and Fall programs? We are enrolling for the current school year, summer camp and next school year. What options for care do you currently provide? We offer both full and part day options for preschoolers ages 2 and older. Our traditional preschool programs have just a few spaces remaining, so don’t wait! In addition, we offer children ages 3-6 a Montessori option with morning, or extended day schedules. 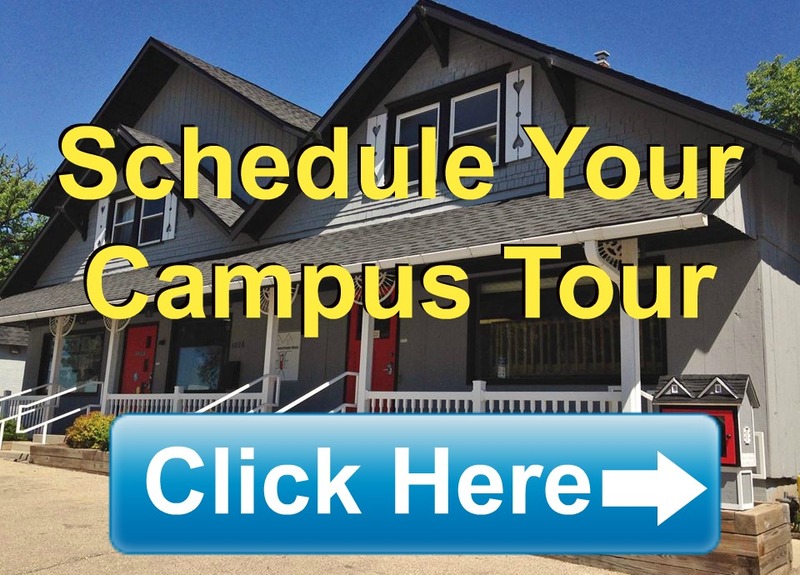 We invite you to set up a tour of our facilities so you can see the various choices. C.C.’s Clubhouse is the place to be for school-agers after their busy day at school. We offer state-licensed, ratio-based professional supervision in a fun, safe environment. Don’t miss checking out this important factor when considering after school programs. Your child’s safety is too important. Is the Caring Center and Verona Montessori house flexible with scheduling my child? Yes, very much so. Children can attend 2-5 days per week in our traditional programs and 3-5 days per week in our Montessori program, either full days or mornings only. Where is the Caring Center & Verona Montessori House located? We are uniquely situated just across the street from Sugar Creek and New Century schools, and bus service is provided to our after school enrichment programs from Country View and Core Knowledge. The Montessori school is located on the upper floor of our main building. What about your Montessori School? You no longer need to drive to Madison for a Montessori school! We are enthused about this option for ages 3 to 6, which meets in the upstairs of our main building in a newly remodeled classroom space. The space is beautiful, calming and focuses on natural elements. We are proud to be the first to offer Montessori school programming as another choice for Verona-area families. You can choose from three to five days per week for your child. Interested in Montessori school, but not really sure what it is like? Contact us for more information and a chance to observe learning in action. How do I know if there is still space available in a particular traditional preschool or school-age childcare program? Some spaces still remain in our full-day preschool programs. Don’t miss out – call now to reserve a place for your child! Preschool programs have come and gone in Verona, but one constant remains – The Caring Center is here to serve families with quality programs staffed with caring teachers. How do I learn more about the programs offered? You can visit The Caring Center campus and see what makes us different! Our center is unique in that we are comprised of three separate, age-specific buildings, all located on the same property.